Background: The use of herbs such as Irvingia gabonensis (Aubry-Lecomte et O'Rorke Baill) for nutrition and to treat diseases is almost universal among nonindustrialized societies, as it is often more affordable than modern pharmaceuticals. Therefore, the objective of this study was to screen the coagulation potentials of the crude methanolic leaf extract of I. gabonensis in albino wistar rats. Materials and Methods: Thirty albino wistar rats were used for the study. They were grouped into: A, B, C, D and E, with Group A as the control. The test Groups (B-E) were orally administered with graded concentrations (50, 100, 150 and 200 mg/kg body weight) respectively once daily for 9 days. Four ml of venous blood was collected from the ocular plexus on days 3, 6 and 9. Two ml was delivered into a test tube containing 0.25 ml of trisodium citrate anticoagulant for the determination of prothrombin time (PT) and activated partial thromboplastin time (APTT). The remaining 2 ml was emptied into tripotassium ethylene diamine tetra-acetic acid anticoagulant bottle for the determination of platelet count. Results: All investigations were analyzed using standard hematological methods. There was no statistically significant difference (P > 0.05) when all the parameters evaluated in the test groups were compared with the control group on day 3. 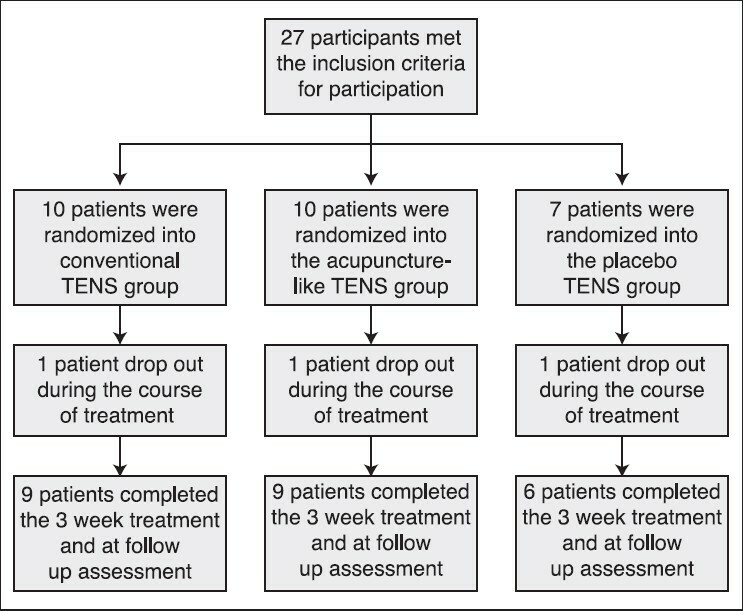 However, there was a statistically significant decrease in Groups B and C (P < 0.05 each) in APTT when compared with the control group on day 6. In addition, there was no statistically significant difference (P > 0.05) recorded in all the parameters investigated in all the test groups when compared with the control group on day 9. There was neither duration of exposure nor dose-related statistically significant difference (P > 0.05) in all the parameters evaluated in all the test groups when days 3, 6 and 9 were compared. Conclusion: From the result of the present study, it can be concluded that I. gabonensis crude methanolic leaf extract has no adverse effects on PT, APTT and Platelet mean values at low dose and short duration. Introduction: Asymptomatic bacteriuria (ASB) in pregnancy is associated with acute pyelonephritis, premature deliveries, low birth weight, still birth, pre-eclampsia, hypertension, anaemia, and postpartum endometritis. Early detection and treatment of this condition reduces the incidence of these complications. Objective: To determine the prevalence, associated bacteria agents and susceptibility, and risk factors of ASB among pregnant women at the University of Benin Teaching Hospital. Materials and Methods: Two hundred and sixty five respondents were selected using systematic sampling method, between November 2011 and October 2012. These subjects provided clean catch midstream urine samples that were cultured, significant bacteriuric isolates were identified through biochemical tests and sensitivity against regular antimicrobial agents carried out. Data were analysed using SPSS version 16. Results: Of the 265 urine samples cultured, 28 (10.6%) had asymptomatic bacteriuria. Isolates were predominantly Escherichia coli (46.4%), Proteus species (14.3%), Enterococcus faecalis (10.7%), and Staphylococcus aureus (10.7%). These organisms were generally susceptible to tested antibiotics at different degrees. Risk factors included maternal age, parity, and level of education of the woman, as well as spouse's level of education. Occupation of the woman and that of the spouse, gestational age, religion, and ethnicity were not risk factors. Conclusion: Prevalence of ASB among pregnant women in University of Benin Teaching Hospital was 10.6%. Age, parity, and levels of education of both the women and the spouses were risk factors. Periodic surveillance of prevalence, etiology and antibiotics susceptibility is recommended. Background: Thrombo-embolic disorders are one of the major causes of 'morbidities and mortality' worldwide. Antithrombotic therapy which comprise use of anti-platelet agents, fibrinolytic agents and anti-coagulants seem to be ineffective in the treatment of thrombi due to side effects and delayed onset of effects, along with chances of hemorrhage. Euphorbia neriifolia Linn is a large succulent shrub, with stipular thorns and is found throughout the Deccan peninsula of India. The plant is known for its medicinal value. A number of evidence about resins and flavonoids has demonstrated potent antithrombotic effects in vitro and in vivo due to prevention of the actions of 'cyclooxygenase and lipoxygenase pathways'. Aim: The present work was designed study antithrombotic potential of this E. neriifolia Linn. Materials and Methods: The whole plant of E. neriifolia Linn were shade dried at 37 o C to 40 o C and coarsely powdered through mesh 20. Powder was defatted with petroleum ether and extracted with ethanol by soxhlet apparatus and subjected to phytochemical analysis. Acute toxicity of extract was determined by Organization for Economic Cooperation and Development guideline No 423. Carrageenan-induced rat tail thrombosis model was used to study the anti-thrombotic effect by measuring thrombosis of tail and bleeding time as well as clotting time. Result: The extract was found to be rich in flavonoids, polyphenols, alkaloids, tannins and resins. Swelling and redness were observed within 2-3 h after intravenous injection of carrageenan, and the tail appeared auburn after 6 h, indicating that thrombosis had formed in the tail. Extract significantly (*P < 0.05, **P < 0.01) increased the bleeding and clotting time of the animals subjected to the test. Discussion and Conclusion: In the present work, phyto-constituents like flavonoids and polyphenols could be responsible to demonstrate protective effect on experimentally induced thrombosis in murine model. Background: Human Immunodeficiency Virus (HIV) infection, increases morbidity and mortality among pulmonary tuberculosis (PTB) patients. Data are lacking on the prevalence of HIV among TB patients in rural communities of Edo State, Nigeria. Aim: This study aimed at determining the prevalence and associated risk factors of HIV infection among patients with PTB from 2006-2011 at rural tertiary hospital in Nigeria. Materials and Methods: Venous blood obtained from a total of 250 patients with newly diagnosed cases of PTB was tested for the presence of HIV antibodies using standard technique. A structured questionnaire was used to obtain demographic information. This was a laboratory based cross-sectional study. Results: The overall prevalence of HIV infection among study subjects was 32.8%. Although the prevalence of HIV infection was observed to drop from 36.5% in 2006 to 29. 2% in 2011, the difference was not statistically significant (P = 0.98). Gender was not a risk factor for HIV-PTB co-infection [female vs. male: 37.3% (53/142) vs. 26.8% (29/108); P = 0.10, OR = 1.622; 95% CI = 0.941, 2.797]. Age was identified as a risk factor for HIV-PTB co-infection (P < 0.0001), with participants within the age group of 21-30 years having the highest risk. The prevalence of HIV-TB co-infection was not significantly affected by educational status (P = 0.48), occupation (P = 0.19) and marital status (P = 0.23) of study participants. Conclusion: The overall prevalence of HIV infection among patients with PTB was 32.8%. Age was a significant risk factor for HIV-PTB co-infection. Increased surveillance of HIV-PTB co-infection in rural communities of Nigeria is advocated. Background: Menarche signals the beginning of reproductive years in women. In recent times, the age at menarche has shown a downward trend, and this may be potentially influenced by biosocial factors. Objective: The objective was to determine the current mean age at menarche among secondary school girls in Benin-city and the influence of biosocial factors. Materials and Methods: The study was a cross-sectional descriptive study of secondary school girls in Benin-city. Data collection was by use of pretested self-administered questionnaires. Biophysical parameters of the respondents were also obtained. Age at menarche was compared with social and biophysical indices. Results: Of the 1,408 respondents, 952 (67.6%) had attained menarche. Mean age at menarche of 12.3 ± 1.18 years was estimated. About 16.0% of the respondents attained menarche while still at primary school. Mean menarcheal age was influenced by the social status of parents, being lowest among girls from social class 1 (11.8 ± 1.25 years) and highest among girls from social class 5 (14.1 ± 1.14 years), P = 0.0001. Other factors that influenced mean menarcheal age included family type and size. Anthropometric parameters of postmenarcheal girls were also higher than those of their premenarcheal colleagues. Conclusion: In line with a global trend the age at menarche in Benin-city is lower in this study with reference to previous reports. This was positively influenced by some biosocial factors (such as higher weight/body mass index and mid-arm circumference). Furthermore, the observation of menarche even among primary school girls suggests a need for early initiation of enlightenment and education in adolescent reproductive health. Background: Central to the process of keeping current with clinical information in dentistry is the ability of a practitioner to evaluate the reliability and validity of current scientific evidence. Pertinent to this is a basic understanding of statistics. 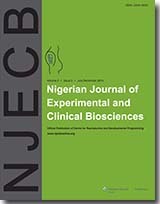 The level of understanding of biostatistics has not been reported among Dental resident doctors in Nigeria. Aim: The purpose of this study was to evaluate dental residents' understanding of biostatistics and the interpretation of research results. Materials and Methods: This was a study carried out among dental resident doctors who attended the revision course organized by the Faculty of Dental Surgery, National Postgraduate Medical College of Nigeria in March 2013. A cross-section of dental resident doctors at the Lagos University Teaching Hospital was also included in the study. Data collected through a self-administered questionnaire included demographic characteristics of the residents, their attitudes toward statistics, and their confidence about interpreting and assessing statistical concepts. Residents' knowledge of statistics was also tested by asking some basic statistical questions. Results: Eighty-one respondents completed the questionnaire. About two-third (66.7%) had taken a course in epidemiology; and 60.5% had taken a course in biostatistics. Only a quarter (25.9%) of respondents could correctly identify that "lower facial height in centimeters" as a continuous variable, and 23.5% thought that centimeters was a nominal measure of facial height. "Facial asymmetry classified as none, moderate, severe" was correctly identified as an ordinal variable by only a third (35.8%) of the respondents. Two keys to the highest level of evidence in a study are blinding and controls. Sixty-eight percent of the respondents correctly identified that this avoids observer and subject bias. However, only about one-fifth (22.2%) correctly identified that a P > 0.05 (not statistically significant) indicates at least a 1-in-20 chance occurrence. Overall, respondents' knowledge of biostatistics was low, with only 29% of the item answered correctly. Conclusion: Most residents in this study lack the knowledge in biostatistics needed to interpret many of the results in published clinical research. Because clinicians need to have such skills to engage in evidence-based practice, every effort needs to be made to include effective training in biostatistics during undergraduate and residency training programs. Context: Glycated hemoglobin is a form of hemoglobin that is measured primarily to identify the average plasma glucose concentration over prolonged periods of time, formed due to non-enzymatic glycation. Previous studies have suggested increased glycated hemoglobin levels in anemic patients despite the shortened life span of the erythrocytes. Several reports have suggested an active role of vitamin D in the functional regulation of pancreatic β-cells. Hypovitaminosis D may be an independent risk factor for type 2 diabetes mellitus (T2DM) with higher HbA1c levels. Studies have also demonstrate association of vitamin D deficiency and greater risk of anemia in children. Aims: The aim of this study is to estimate and analyse hemoglobin A1c, vitamin D and hemoglobin levels in non diabetic anemic adults and assess the relationship between above mentioned parameters. Materials and Methods: The study was conducted at Kasturba Medical College, Manipal. Serum vitamin D, hemoglobin and HbA1c measured in 187 non-diabetic anemic adults of 25-55 years of age, glycated hemoglobin measured in BIORAD variant turbo II using ion exchange HPLC method, and vitamin D by Eletrochemiluminescene method. Hemoglobin estimation was done by Drabkin's method. Results and Conclusion: The study found negative correlation between vitamin D and HbA1c in both males and females (r = -0.5, r = -0.4 P ≤ 0.001), HbA1c and hemoglobin (r = -0.4, r = -0.3 P ≤ 0.002). Also, there was significant positive correlation between the vit D and hemoglobin (r = 0.4, r = 0.3 P ≤ 0.001) values in the study population. Thus, there could be a role of vitamin D in the management of anemia. Since the sample size was small further study is recommended with larger sample size for reliable results. Aim: We hypothesized that Hibiscus sabdariffa drink would affect pressor and myocardial oxygen consumption (MVO 2 ) responses induced by postural stress in young healthy volunteers, and that the impact would be stronger in women than men. Materials and Methods: In a randomized, controlled, cross-over study, 25 young healthy male and 25 female subjects (18-27 years) drank nothing (control), water (500 ml; vehicle) or H. sabdariffa (1.4% w/v) 30 min before standing on three separate days of appointment. We measured supine and standing brachial blood pressure and heart rate (HR). MVO 2 was also estimated by the rate-pressure product (RPP). Results: Increases in systolic blood pressure (SBP) and RPP induced by standing when nothing or water was drunk was significantly larger (P < 0.05) than when H. sabdariffa drink was taken in both male and female subjects. However, H. sabdariffa drink had a stronger (P < 0.05) effect on SBP in women than in men, whereas the effect on RPP was stronger (P < 0.05) in men. Increases in diastolic blood pressure (DBP) and HR induced by standing when water was drunk were significantly larger than when H. sabdariffa drink was ingested in men. Conversely, increase in DBP induced by standing during water ingestion was not significantly attenuated by H. sabdariffa drink in women. 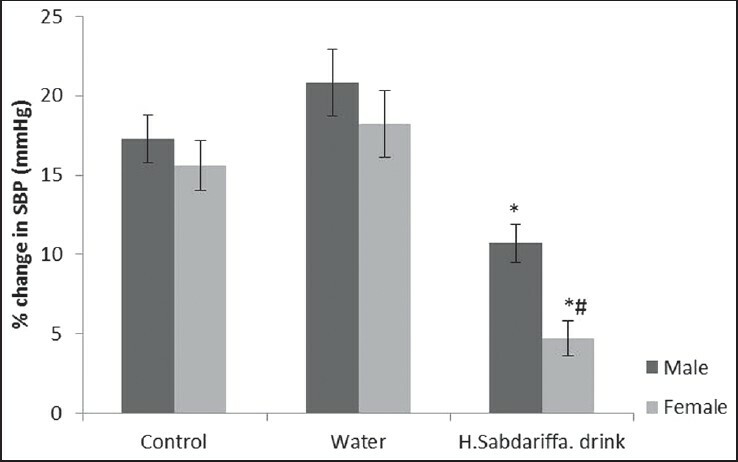 Conclusion: The findings in the present study indicate H. sabdariffa drink impacts positively on the heart by reducing its demand for O 2 during postural stress, with a stronger effect in men relatively to women. This may be an important dietary intervention in preventing the development of cardiac dysfunctions among young individuals. Background: Violence in families has attracted increasing attention, especially because of indications that it may be more common than has previously been supposed. Assault has attracted increasing attention, especially due to the fact that it may be more common than has previously been thought, and a high incidence has been reported among family members. Objective: The objective of this study was to develop a database of facial injuries arising from cutlass as the major tool of attack at a Nigerian teaching hospital and to determine the patterns of trauma in these cases . Materials and Methods: We conducted a prospective study of 106 consecutive patients with facial injuries from the assault with cutlass using a preformed questionnaire. The patients were seen at the Maxillofacial Unit of Dental Department, University of Uyo Teaching Hospital and treated for various degrees of facial injuries between February 2012 and March 2014. Results: Victims within age range 21-30 years were 21.71%. Majority (67.92%) of the incidence took place in the rural areas and 23% in the urban area with more of the assaults occurring in the evening. Majority of the victims (52.83%) and offenders (41.51%) were married. This association was statistically significant (χ2 = 8.97; df = 3; P = 0.03). There was a similar significant association between the gender of the victims and the offenders (χ2 = 10.84; df = 1; P = 0.001). Conclusion: Most assault took place in the evenings and tends to occur in the victim's residence. The offenders and victims were predominantly men, and the injuries were mainly located around the eye and ears. Victims related to the offenders had, however, a higher proportion of injuries to the body. Background/Objectives: Sickle cell anemia (SCA) is a major public health problem and renal insufficiency is common in adult sickle cell disease (SCD) patients, but the presence of high levels of fetal hemoglobin (HbF) may be protective against organ damage. This study correlates the levels of HbF with proteinuria and indices of iron status in adult SCD patients in a steady clinical state. Materials and Methods: HbF, serum iron, transferrin, total iron binding capacity (TIBC), percentage transferrin saturation, urine protein, and full blood count were determined in adult SCD patients. Serum iron, unsaturated iron binding capacity were determined by spectrophotometric method. TIBC and percentage transferrin saturation were calculated from iron concentration and unsaturated iron binding capacity using the appropriate formula. Serum transferrin was calculated using the formula of the Miami Valley Burn Unit. Results: Out of the 97 subjects, 24 (25%) had mean HbF level of 8.48 ΁ 0.54% and none of them had proteinuria, while 28 (29%) who had mean HbF level of 3.00 ΁ 0.11% had proteinuria. The mean age of those who had proteinuria was higher (P < 0.001) than those without proteinuria. The mean HbF level of those with proteinuria was significantly lower (P < 0.001) than those without proteinuria. Significantly higher levels of serum iron and percentage transferrin saturation (P < 0.001) and significantly lower levels (P < 0.001) of TIBC and transferrin levels were observed in those without proteinuria compared to those with proteinuria. HbF negatively correlated (r = −0.315; P < 0.01) with proteinuria in adult SCD patients. HbF also correlated with indices of iron status in SCD patients with and without proteinuria. Conclusion: HbF correlated with proteinuria and indices of iron status in adult SCD patients in steady clinical state. Anterior crown fractures are common form of traumatic dental injuries that mainly affect the maxillary central incisors, in children and teenagers. During their first dental visit, these patients with trauma are quite apprehensive because of impaired functions, esthetics and phonetics. The advances in adhesive dentistry have allowed dentists to use the patient's own fragment to restore the fractured tooth if the fragment is available. Reattachment is such an ultraconservative technique which provides safe, fast, and esthetically pleasing results with immediate restoration of function and phonetics. This paper discusses three cases in which fragment reattachment was done using a different combination of techniques viz. simple reattachment, circumferential bevel and internal dentinal groove. 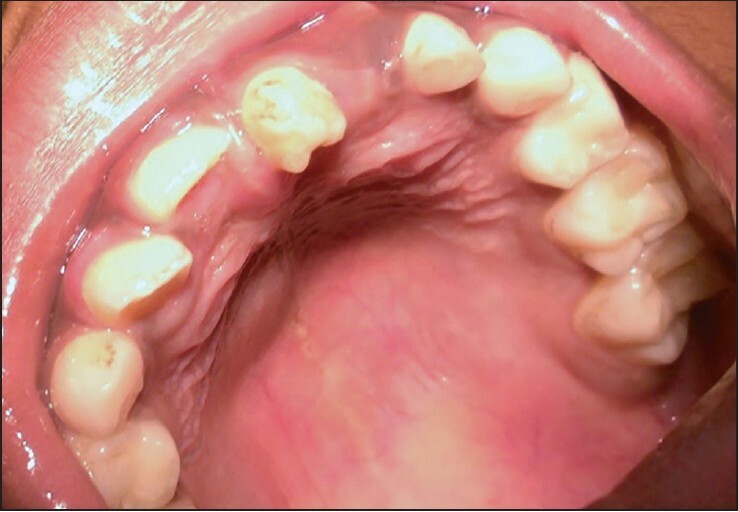 Talon cusp is a relatively uncommon developmental anomaly usually involves maxillary permanent lateral incisors. Mesiodens is the most common supernumerary tooth present in the palatal midline between the two maxillary central incisors. Both talon cusp and mesiodens are clinically significant developmental alterations giving rise to a variety of complications. The presence of talon cusp on supernumerary teeth is very rare. Till date very few cases have been reported in the literature. This paper describes two cases of talon cusp on the palatal surfaces of supplemental mesiodens. 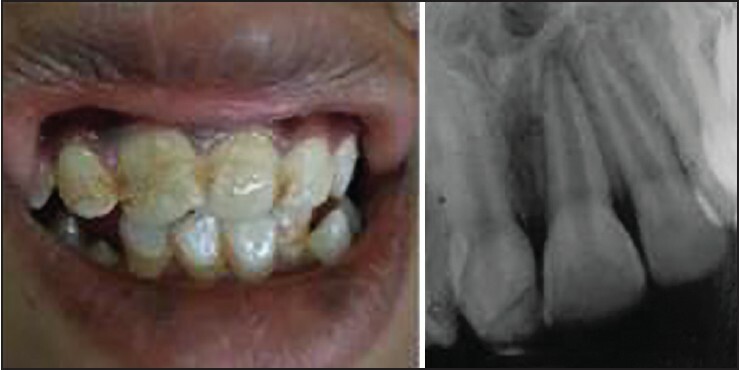 Both the patients reported for unsightly dental appearance and non-eruption of maxillary permanent central incisor. Here we extracted the anomalous teeth to facilitate eruption of permanent maxillary central incisor. Early diagnosis and management are important to avoid complications. An awareness pertaining to the variations in root morphology in primary teeth is highly important among clinicians to render best treatment and in the maintenance of these teeth in the oral cavity. 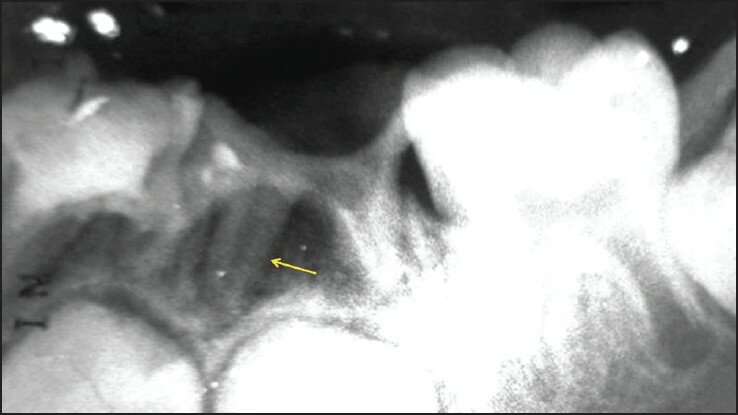 Primary mandibular second molars usually have two roots with three canals. Very rarely an additional supernumerary root occurs and when this extra root is situated mesiobuccally it is referred as radix paramolaris (RP) and when it is present distolingually to the main distal root it is called as radix entomolaris. 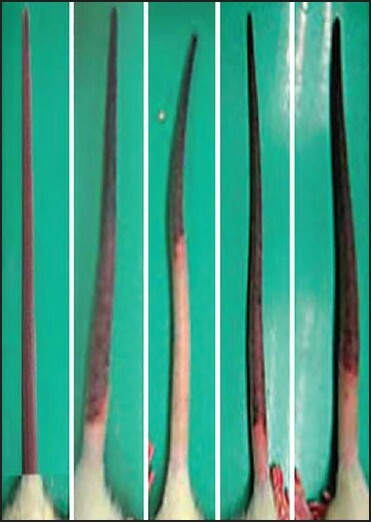 Most of the times, this extra root remain undiagnosed due to its overlapping with the main mesial root on radiographic examination leading to endodontic failures. The aim of this paper is to present two cases of RP in primary mandibular second molars and to describe its clinical significance.